Caroline had the sweetest personality. She complained very little, even when her body was failing her. She was happy to be passed from person to person, making it easy for everyone to hold her who had any desire. When someone came to visit, holding her was usually a strong desire. I am happy that everyone who wanted to hold Caroline got the chance to bond with our special, beautiful baby girl. One thing that Caroline did not like was having her clothing adjusted. Diaper changes were not her favorite – she did not like being exposed as some babies do. Most of all, she hated the touch of a cold stethoscope. Her nurses always did their best to warm up the stethoscope before taking a listen, but she still complained about having her clothes disturbed. My husband and I got very good at listening through her clothes for the “puff” in her stomach to check that her feeding tube was in position. She was much happier when we were able to keep her clothes on while feeding her. 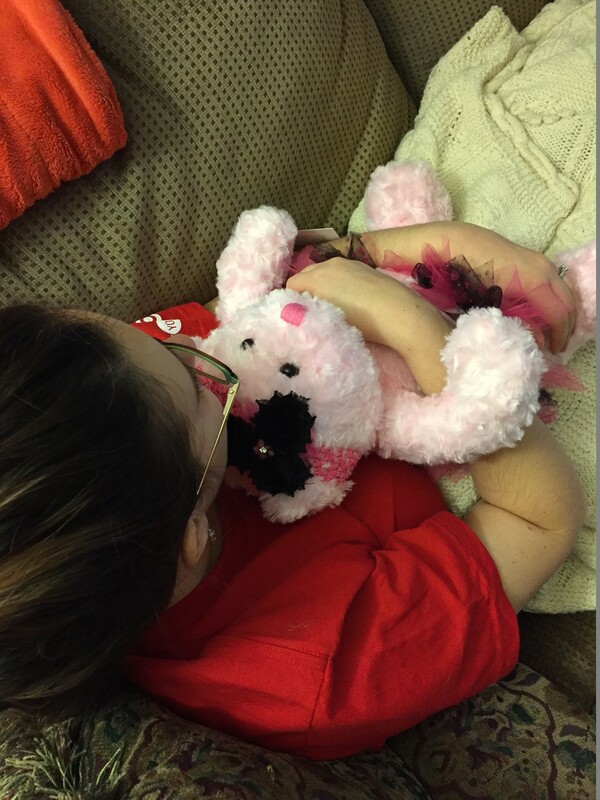 Caroline loved cuddles. We spent many hours together in a rocking chair or on the couch with her on her side pressed against my chest. She loved looking around at new surroundings. She loved the feel of warm sunshine. She loved music. She loved showing off her many girly outfits. I love and miss everything about my sweet, precious daughter. See you soon, Caroline. Mommy loves you. Categories: Memory Monday | Tags: infant loss, outfits, personality, pictures, stethoscope | Permalink. I have some exciting news to share! Remember about a month ago when I told you that my husband won a contest with Target? Last Friday, they helped him to fulfill his dream! 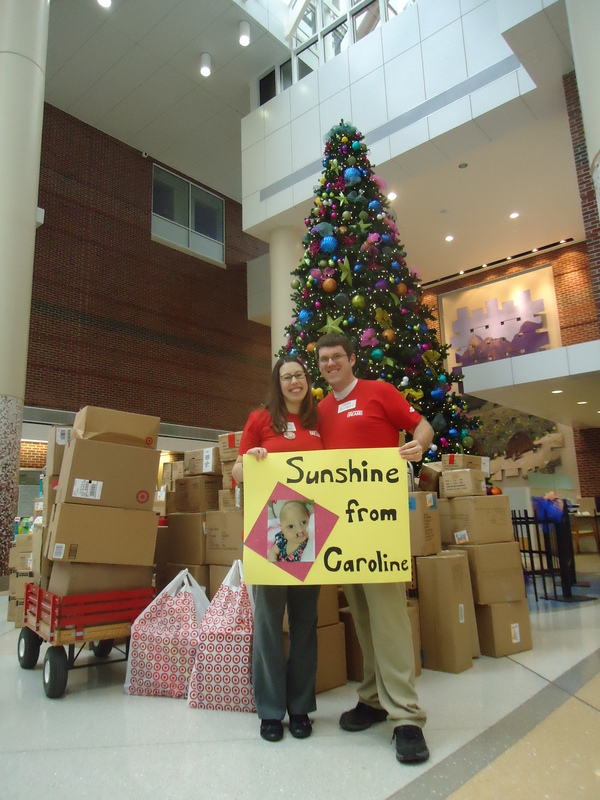 We brought the toys that we had collected, about 150, to the local children’s hospital in Caroline’s name. We were met by a truck full of toys sent by Target, which brought our total to over 2000! It was a huge donation that is going to help kids facing a tough time to find some joy. Doing this in her memory has been so healing and has helped our family through our first holiday season without our daughter. We are so thankful both to Target and to everyone who sent in a donation. It means so much to us! 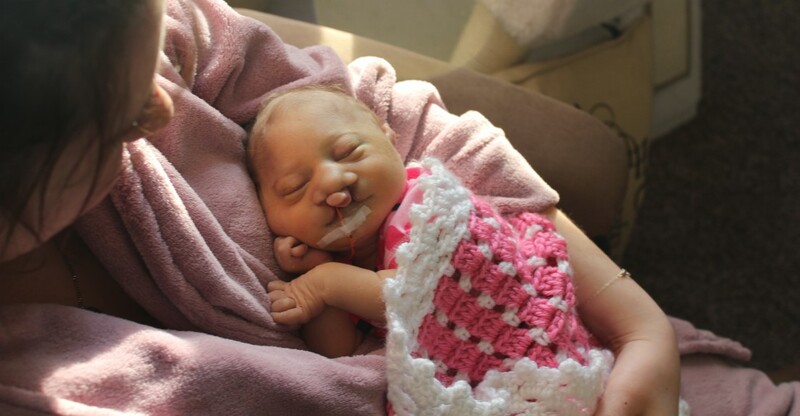 Our little girl is such an inspiration and changes the world for the better every day. Below are a few more pictures! Even more pictures with more details can be found at www.fb.com/sunshinefromcaroline. 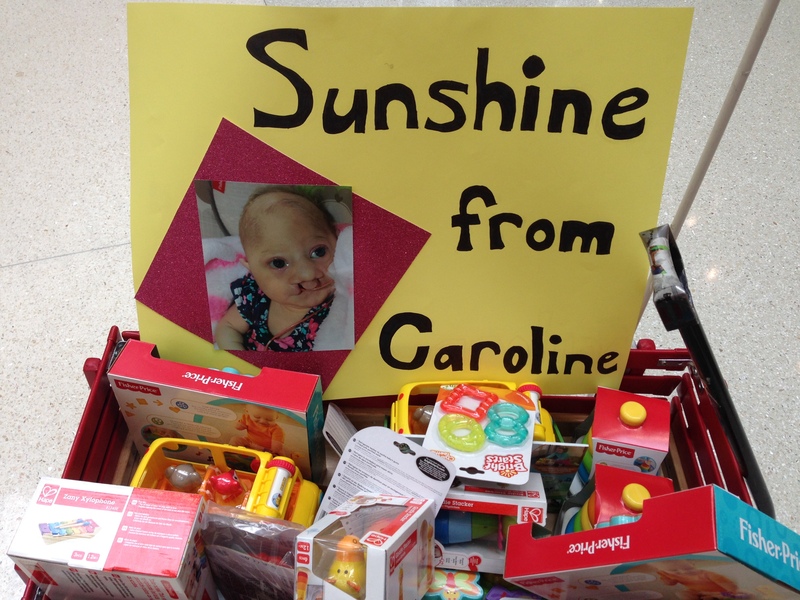 Categories: Sunshine from Caroline | Tags: dream, hospital donation, sunshine from caroline, target, toys, well being dream | Permalink. 12/18/13: Hi sweetheart. Your mama has had a lot of hip pain recently but you were more active today which was reassuring and made me happy. Today we did some Christmas shopping – got my mom a bracelet and got my dad a spatula for grilling. Getting a present for your daddy has been difficult – I have a few ideas but nothing has worked out and I’m running out of time! Today I made you a preemie sized tutu with green and purple tulle and pink ribbon with purple flowers. It came out really pretty and it’s too beautiful for the onesie that inspired it so I have to get one that will better match it. I am glad to have an outfit ready for you if you come early. It feels like picking out your prom dress and your wedding dress and your mother of the bride dress because it may be the only outfit you wear and I want it to be beautiful just like my baby girl. 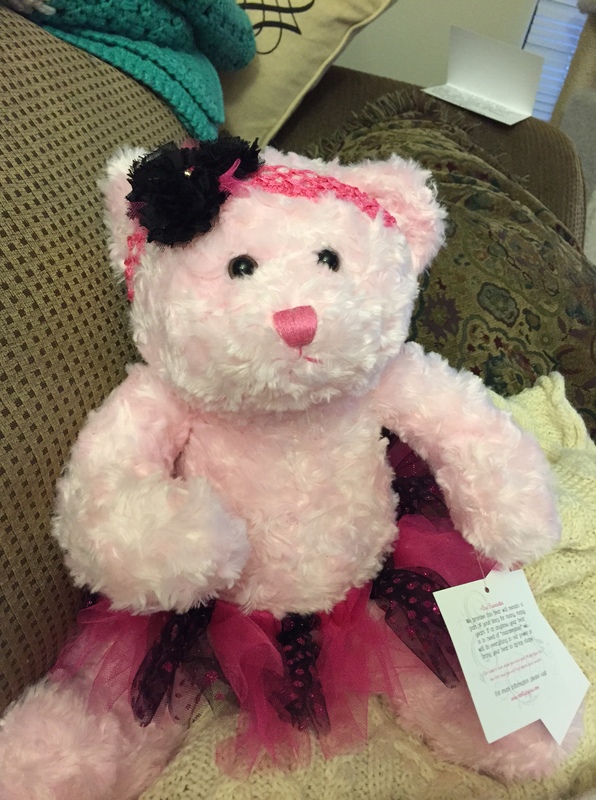 Categories: Memory Monday | Tags: beautiful, journal, love, outfit, tutu | Permalink.